I have a once a month bake sale to benefit the Activities Department of the local nursing home, and I made these for my most recent sale. They literally flew off the table! 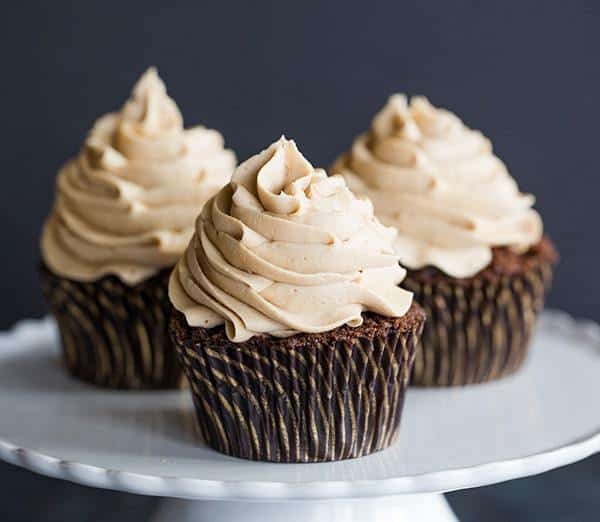 The combination of chocolate and coffee is heavenly – thanks, Michelle, for this and all the other fabulous recipes you post. Your site is #1 in my baking bookmarks! Aw, thank you so much, you’re so sweet! Glad these were such a huge hit at the bake sale and helped to raise money for a great cause! Hi Nadia, No, you could use fat-free milk and keep everything else as-is. Enjoy the cupcakes! Yum! These cupcakes are delicious! I didn’t get much of the coffee flavor – and I even used full strength espresso instead of coffee! 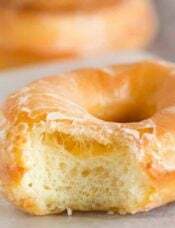 – so I might increase it next time, but they were sooo moist and perfect with the frosting! 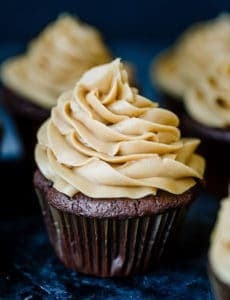 On the frosting, I added some Kahlua and alot more espresso powder and it was SOOO good, perfect combination! Oooh seagirl, LOVE the addition of Kahlua, totally doing that the next time I make these! Thanks for stopping back to share your review! I used Kahlua after finding myself short of vanilla at the end of a week with a house full of guests (and lots of baking for everyone). It really enhanced the creaminess of the frosting and it smelled heavenly. Great addition! Joselyn, Awesome to hear about your recipe success with these cupcakes! Happy early birthday to your nephew! I made these for the Lijit Crew, who are big fans of caffeine and sugar, and received rave reviews! I have never been so happy with the texture and level of moisture in a from-scratch cupcake before. And the frosting…oh my gosh…I too have been working on buttercream techniques and am now amazed that it gets better and better every time. I was afraid it would deflate by the middle of the day, but all was well. I also thought chocolate chips would make a nice addition to the batter, and maybe a few sprinkled on top for those of us that don’t have a 1M tip. 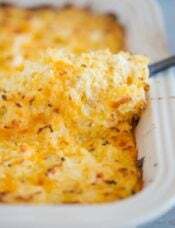 Thanks for another amazing recipe Michelle! Shelly, Thrilled to hear that so many of you loved these! I agree – the frosting is definitely the star (although, isn’t it always?!)! Mine were not moist. They turned out light, dry and crumbly. I’ve tried them twice now, double checking measurements and freshness of ingredients. The second time I tried making them I also cut down on the baking time. Not sure what I am doing wrong. 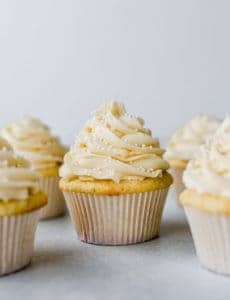 Just got through baking these (I ended up with 15 hee hee) and I haven’t even started frosting them because I just had to come tell you how amazing these are!!! I had my ‘sample’ and WOW! The frosting is out of this world!!! Next time I think I’ll put chocolate chips in the batter ;-) Thank you so much for the fantastic recipe!!! 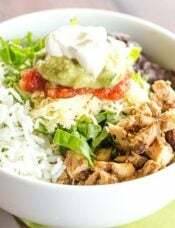 Delicious recipe and thanks for the comment our blog! I brought these into work and they were devoured within an hour (at 9am!). 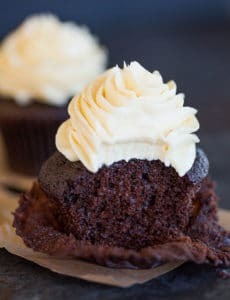 I even received a couple comments along the lines of “this was the best frosting I’ve ever had in my life.” Clearly, you can’t go wrong with buttercream. Anyhow, I do have a question for you. As you may have noticed, I used brewed espresso in the cake & frosting instead of espresso powder. I initially tried the espresso powder, but had a difficult time getting it to dissolve in the coffee and vanilla. Any tips? What kind of espresso powder did you use? I think the brewed espresso was excellent and serves as an adequate substitute, but I was just curious about your methods ;P. Thanks! And these are so lovely by the way. Great job! can I freeze the frosted cupcakes? do you have recipe for chocolate moist cake? Where should I keep these gorgeous? Buttercream is not something you frost with here in Israel (too hot!!!) so I don’t have any information about right storage. it’s about 30 degrees Celsius (86 Fahrenheit). Is it safe keeping them outside the fridge or should I refrigerate them? At 86 degrees F the buttercream would start to melt, so I would store the cupcakes in the refrigerator and then let them sit out and come to room temperature before serving. Absolutely stunning first photo – very tempting!! Oh my, these look sooooo delicious. Anything with chocolate and espresso has to be a winning recipe. You have inspired me to try these and practice my piping skills. I love your website…and I can’t wait to try your recipes. 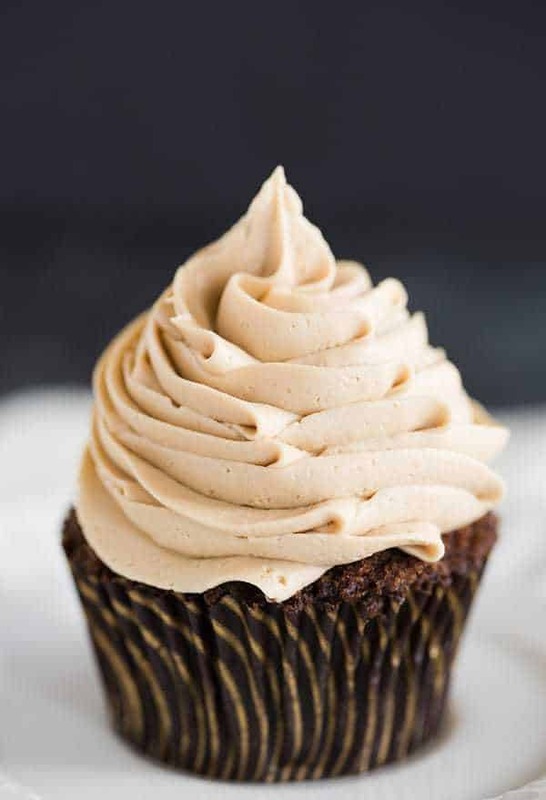 How do you get the frosting to look so great – any advice or tips on using the 1M or other frosting tips? For cupcakes I typically hold the piping bag straight up and down and then, starting on the outside, pipe a continuous circle around the outside, then into the middle, covering the top of the cupcake. Then I release and pick the bag up and do the same thing again, to create a mounded effect. I am going to be doing a series of icing, piping and decorating tutorials beginning in September, and cupcakes is on the list, so keep an eye out – there will be step by step photos and video! Did you do the tutorial yet? I’m searching through your website and can only find the royal icing one. Hi Loli, Gah! No, I haven’t yet. I need to get down to it! I really would like the tutorial as well. Looking forward to it! Me too, we have an event coming up and I would love to make these beauties! These cupcakes are absolutely beautiful! These were easy to make and are sooooooooo great! They are even great gluten free!! 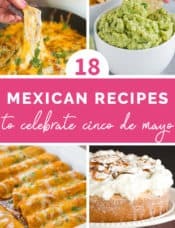 Thanks for all of your wonderful recipes! I really want to try these, but I have no idea how to make them gluten-free…does anyone have the specific substitutions (preferably tested)? I am new to the GF thing and need help!!! Wow! The frosting looks fantastic. 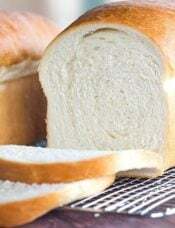 Really wanna have a bite into it. Irresistable! Wow! 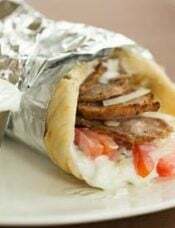 Do these ever look good. I’m certain I wouldn’t be able to eat just one. Food Blog Search is one of my favorite places to search for recipes, too. Made this into a cake yesterday with my teenage daughter. Although we didn’t have espresso powder, the taste was fantastic. I can’t wait to make this again! Thanks! This is some of the most beautiful icing I’ve ever seen! 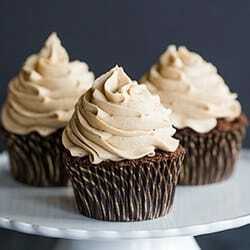 Anything coffee flavored always sounds good to me.. these cupcakes are beautiful! And I like that you do a 1:1 ratio of icing to cupcake.. I do the same thing! Man these look good! I bet our old and new Mocha Acoyltes would love this recipe. Thank you for sharing it. Your frosting looks great! Wish I could be that fancy with decorating but I seem to have unsteady hands so I make up for looks with tons of chocolate. These are just delicious!!!! I’ve made them already, but could not make them to puff up!! what could I be doing wrong?? I checked my baking powder and soda and worked fine… could it be butter (I used sweet cream butter) ???? Do you happen to have measurments in oz. (lbs.) for ingredients?? I am wondering, maybe my quantities varied from yours!! It would be of great help…. I will make them again, and post my measurements and see!!! Beba, I had the same thing happen to mine. They came out delicious, but I found the cake to be very light, and did not produce a dome top. The fell a bit after cooling. I even cooked them for the full 20 minutes to try and avoid that from happening. I used regular butter as well. Hi Becka, Thank you! The cake stand is actually from Marshall’s! Anytime I’m near a Marshall’s, TJ Maxx or Ross I take a spin through the kitchen department to see if there are any good finds. This was so cute and only $5! I use Food Blog Search a lot too!! These look awesome. These look lovely! I love the cake stand too! 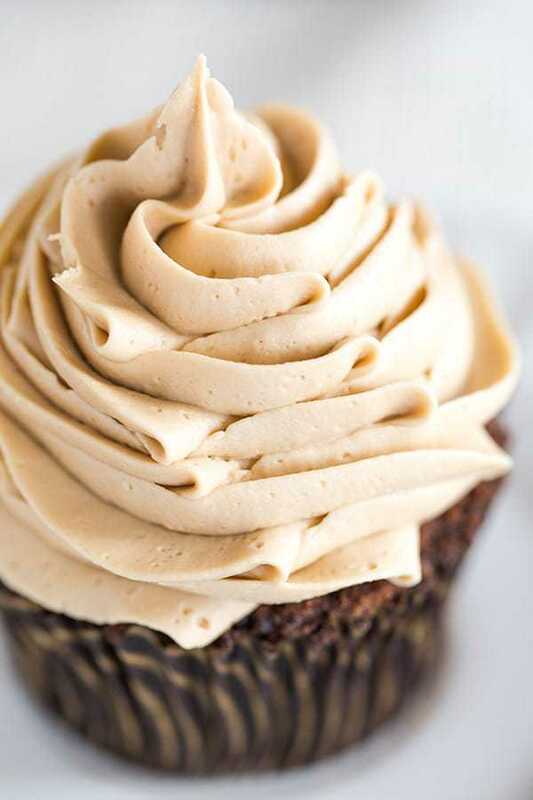 I’m not a big cupcake fan, but I’ll make an exception for any that are topped with an espresso buttercream frosting. 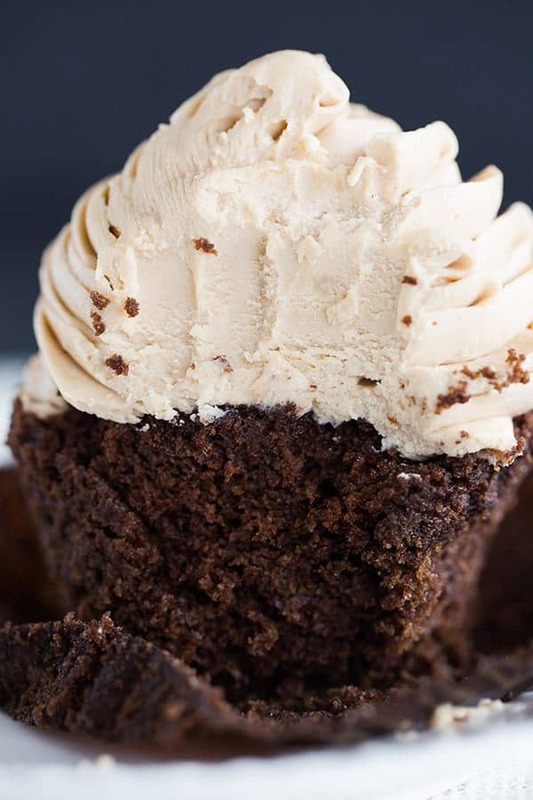 In fact, skip the cupcake and just pour the frosting in a cup for me. They’re absolutely gorgeous. Thanks for passing along the recipe. AMAZING photos!! but before getting amazing photos, the cupcakes are beautifully done like a PRO! I am completely in awe!